After flawlessly completing a 10th rendezvous braking manoeuvre since 7 May, Rosetta arrived today at its destination and is now 100 km from the nucleus of comet 67P/Churyumov-Gerasimenko. 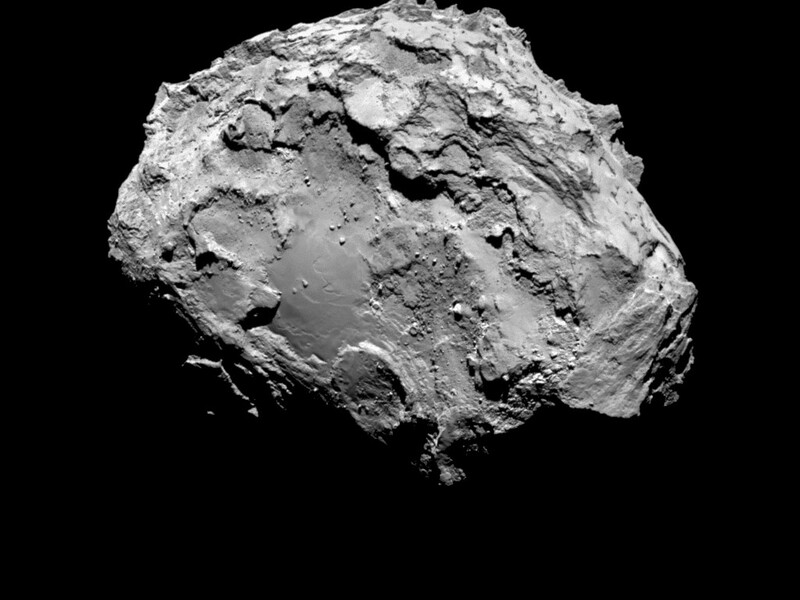 The nucleus of 67P imaged by the OSIRIS-NAC camera on 3 August from a distance of 285 km; the resolution is 5.3 m/pixel. Credits: ESA/Rosetta/MPS for OSIRIS Team MPS/UPD/LAM/IAA/SSO/INTA/UPM/DASP/IDA. When it woke up from deep space hibernation on 20 January, Rosetta found itself some 9 million km from the nucleus of comet 67P/Churyumov–Gerasimenko and closing in at a speed of nearly 775 m/s. Since 7 May, 10 rendezvous braking manoeuvres have reduced its velocity relative to the nucleus to 1 m/s, i.e. 3.6 km/h. The last rendezvous manoeuvre was successfully completed today and Rosetta is now accompanying the nucleus on its elliptical orbitas the two bodies—one natural, one man-made—hurtle around the Sun at a speed of close to 55,000 km/h, 405 million km from Earth. 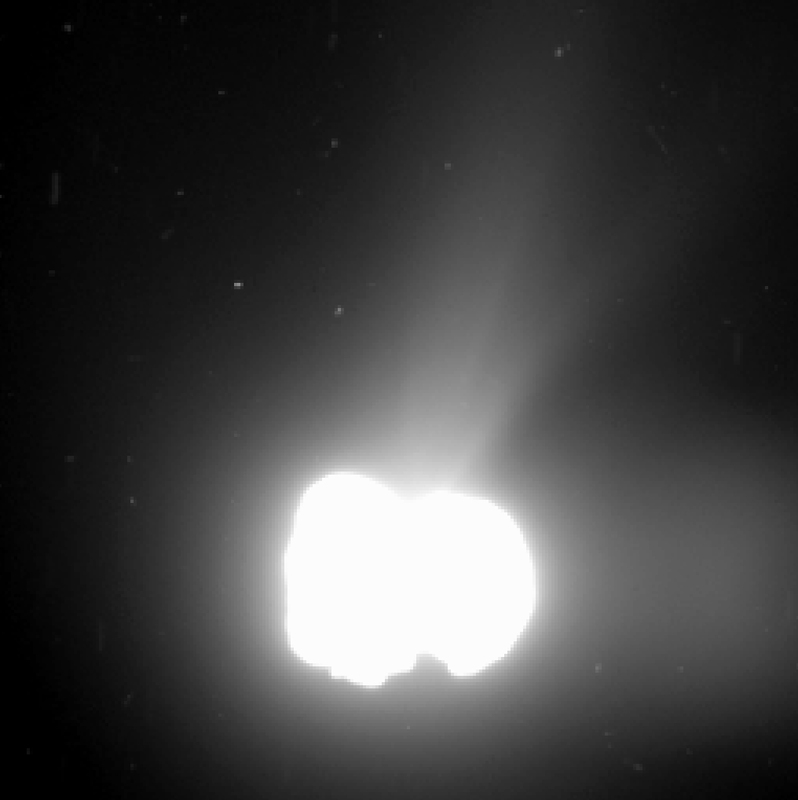 A long exposure (330 seconds) by the OSIRIS-WAC camera from a distance of 550 km shows the comet’s activity. Credits: ESA/Rosetta/MPS for OSIRIS Team MPS/UPD/LAM/IAA/SSO/INTA/UPM/DASP/IDA. Rosetta is currently flying 100 km ahead of the comet, escorting it on its elliptical path around the Sun at a great vantage point to permanently observe the sunlit side with the nucleus spinning at the rate of one rotation nearly every 12.4 hrs. Over the coming weeks, the spacecraft will edge closer to study the gravitational field of the nucleus and determine the tiny body’s mass as precisely as possible to allow engineers to refine the probe’s final orbital sequence. Ultimately, Rosetta is set to go into a circular orbit 10 km from the surface of the nucleus and then descend to just 5 km to release the Philae lander. 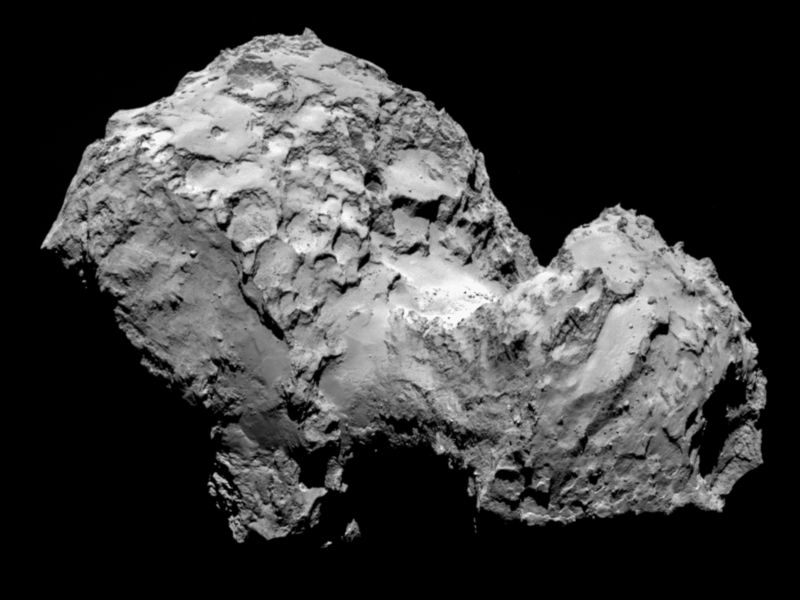 At the same time, Rosetta’s instruments will subject the comet to close scientific scrutiny in order to identify a landing site for Philae this autumn. The date currently scheduled is 11 November, but the landing may occur earlier or later. The goal now is to identify 5 possible landing sites by the end of August and select a primary site by mid-September. The team at the Science Operations and Navigation Centre (SONC) at CNES in Toulouse is responsible for this crucial task of determining the site that best matches all of the mission’s technical and scientific constraints.